I spend a great deal of my life taking risks. 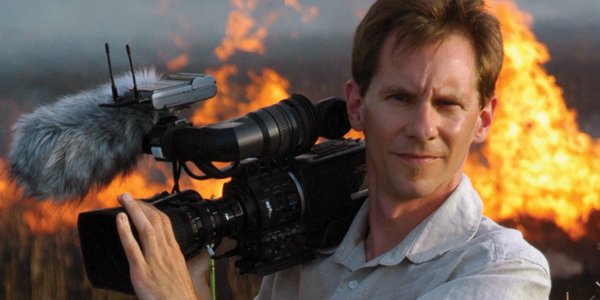 As the host of the Angry Planet TV series, I often find myself chasing after tornadoes, driving into the eye of land-falling hurricanes, or climbing into the crater of an exploding volcano. I’ve dove with sharks, swam with thousands of piranhas, and taken a small inflatable raft out onto the world’s largest sulfuric acid lake – seriously, I’m not making this stuff up! My explorations of the extreme have taken me to over 40 countries and all seven continents. While my risk-taking tends to be at the far end of the spectrum, where mistakes or miscalculations could mean serious injury or worse, we all take risks. We take financial risks, especially with the state of the current economy, and we take emotional risks when we tell someone that we love them and hope that they feel the same way. Many times, these risks can be just as frightening as finding yourself in a potentially life-threatening situation. Similar stimulus can invoke the same physical reactions in two different people, yet they perceive it in completely different ways making for two very different experiences. Imagine jumping out of an airplane. To an adrenaline junkie, it’s an exhilarating rush. To someone afraid of flying, let’s just say that you might need to get their jumpsuit sent out to the cleaners afterward! For me, fear has been as much of a helper as a hinderance. People often think that I’m totally fearless because I face down so many terrifying things that “normal” people evacuate from. But that couldn’t be further from the truth. I get scared – sometimes REALLY scared, but over the years, I’ve learned to harness that fear and use it as a yardstick to measure my exposure to danger. Fear keeps me sharp when I’m in the middle of the chaos in a hurricane. Fear tells me when to back off from a tornado that might change its direction. Fear helps keep me alive and so I acknowledge it, embrace it, and learn lessons from it. One question that I get asked a lot is, “When have you been the most afraid?” That’s a tough question to answer because the risks and dangers in storms usually only last a brief moment (or maybe a few minutes) and then it’s all over. The night before Hurricane Katrina made landfall was agonizing. I was with a group of other storm chasers and we hunkered down in a steel-reinforced, concrete parking garage in Gulfport, Mississippi – the spot where the strongest part of the storm hit. We knew that the next 24 hours were going to be intense, historic, and very, very dangerous. The warnings from the National Weather Service were apocalyptic, describing how buildings were going to fall and how small cars and household appliances were going to become deadly missiles in the intense winds. We held our ground and made it through alive, thanks to our knowledge and experience. But even that was not the experience that filled me with the most fear. In one of my crazier Angry Planet adventures, we decided to visit Kitum cave. It lies on the slopes of Mount Elgon in northern Kenya, and is well known because it’s the only place in the world where elephants go underground (into the cave) at night in total darkness. They follow along a difficult, boulder strewn path to the very back of the cave where they scrape the walls with their tusks and chew the debris, trying to get at the salt that the rock contains. The vegetation in northern Kenya’s forests is low in sodium so the elephants come to Kitum to satisfy their salt need. Although I knew it wouldn’t be easy, I thought this would be a fascinating location to showcase on television. The cave also became well known when it was featured in the book, The Hot Zone by Richard Preston. Richard described two instances of Marburg Hemorrhagic Fever that were contracted at Kitum. Marburg is a deadly disease that is closely related to the Ebola virus. Symptoms begin with a headache and fever, then your internal organs begin to dissolve and liquify. Most victims die within a week and a half due to extreme internal and external bleeding. While there have only been a few cases of Marburg contracted at Kitum, of those, the mortality rate has been 100%. The fruit bats who live toward the back of Kitum Cave have been linked to the Marburg virus, but it’s a scientific mystery as to how the virus moves from bats to humans; we simply don’t know. • The possibility of encountering a herd of irate elephants in an enclosed space and being trampled to death. • Encountering other wildlife, such as leopards, hyenas and dangerous cape buffalo, who frequent the caves looking for an easy meal. • Biohazards such as Rabies and Leishmaniasis contracted from the bats and other cave-dwelling animals. • The possibility of cave collapse – since these caves are mined by the elephants, they’re far less stable than most other caves. Sound like a nice place for a vacation? Sure it’s not for everyone, but for me, I thrive in places like Kitum. I take risks, but they’re calculated risks. I try to do dangerous things in as safe a manner as possible. I took every precaution. I brought with me Don McFarlane, a leading biologist and bat expert who was familiar with the caves in the area and who had mapped Kitum Cave before our excursion. Don and I were both decked out in protective clothing: Tyvex coveralls, surgical gloves, respirators, helmets, and even eye protection. We didn’t want to take any chances, especially since nobody knows how the Marburg virus is transmitted to humans. As we moved deeper and deeper into the cave and approached the bat roost, the smell, sound, and ambient heat of our surroundings began to intensify. Judging by the change in atmosphere and the large piles of bat guano we trudged through, it was becoming clear that there was a large number of bats close by – probably thousands of them. But it was when my cameraman flipped on his light to start filming that all Hell broke loose. Thousands of screeching, fluttering bats began streaming past us, creating gusts of wind as they funnelled through the narrow passageway, emptying their bowels and bladders as they flew directly past us. Things just got worse from there. The bat had bitten through my surgical glove and into the tip of my thumb. Time slowed down and a million thoughts raced through my mind… Had I just accidentally killed myself? Was I now the equivalent of the walking dead, with only a week left to live? I almost threw up thinking about it. Obviously, since I’m still around to write this, I didn’t catch Marburg. But sitting on the side of a mountain in a Kenyan jungle waiting for symptoms to show up was beyond frightful. After a week had passed and my spleen hadn’t turned to Jello, I finally breathed a sigh of relief – although I did still have to endure a full series of rabies shots when I eventually returned home to Toronto. Would I go back to Kitum? Sure I would. The odds of me getting sick were, in reality, extremely low no matter how doomed (in my mind) I thought I was. As a matter of fact, the night that I was bitten by the bat, I decided to camp inside the cave and try to film the elephants coming in. Needless to say I didn’t get much sleep, although, unfortunately, the elephants never showed up. We all need to spend a lot more time outside of our own personal comfort zones; that’s the space where we grow and learn as individuals. Now, I don’t suggest that you all run out tomorrow and start chasing tornadoes or crawling around disease-ridden African bat caves. What I’m suggesting is that, in order to get something you’ve never had, you must be prepared to do something you’ve never done before. 1. Consider the Statistics: More people are killed by vending machines than by sharks each year. The truly dangerous things in life are heart disease, car accidents, and cancer. 2. Practice Makes Better (not Perfect): Every day, try to do one thing that scares you a little bit. 3. Research: The more you know about something, whether it’s stock market trading, real estate, or tornado chasing, the less fearful you’ll be. 4. Conditioning: By gradually exposing yourself to what you’re afraid of, you can train your mind to accept and be comfortable with your fear or phobia. 5. Visualization: Repeatedly go over the situation in your mind. Anticipate obstacles and picture yourself pulling it off with ease. Once you’ve mastered it in your mind, move on to the real world; you’re already halfway there.